Now in our 40th year! Welcome to the Yearling Nursery School! 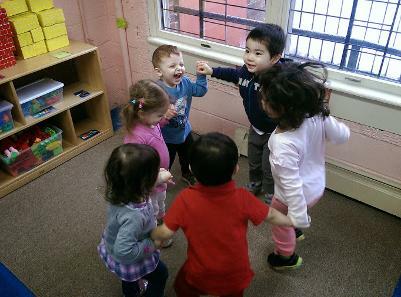 The Yearling Nursery School is a licensed, educational early childhood program. The school contains four classrooms furnished to meet the needs of our various age groups. We strive to provide stimulating materials and a variety of play equipment to foster fine and gross motor development. The outdoor play space contains a fun-house climber slide, other varied climbing equipment, a deck and a garden. The house is set on a quiet corner property which is surrounded by hedges and trees. This gives the school a country like atmosphere. In addition, our school has added new security doors and new security cameras at all entry points. These cameras give a view of all sides of the school. We will also have a view of our play deck and full backyard play area for your child's safety. We look forward to getting to know your child. We invite you to learn more about us and to visit our classrooms soon.